This famous city is the capital of Rajasthan and has earned universal renown as the “Pink City “, and pink it is, with beautiful constructed palaces, havelis and forts. Tall, rugged men with handle-bar whiskers sport bright pink turbans. Jaipur which means the city of victory was built exactly 273 years back and is 262 kms by road from Delhi (Capital of India). A strong wall encircles the old city and even today has reflection of formidable strength; its function of protecting all within is obvious. The plains of Rajasthan of which Jaipur is the capital once thundered and echoed with clash of swords and the drums of wars. 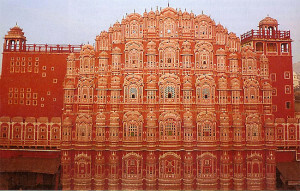 Built in 1727 by Sawai Jai Singh-II, Jaipur was the first planned city of its time. 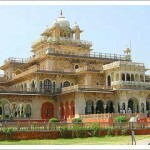 We provide memorable Jaipur tours which can be customized as per your requirements and taste. We provide complete packaged tours that include taxi, planned Itinerary, guide, hotel arrangements and lot of other recreational activities. 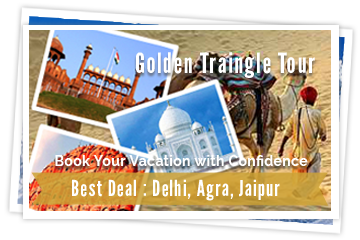 We also provide stand alone tour services like Taxi only, Guide only, Hotel only etc. Albert Hall (Central Museum) :- A fabulous building, which displays Indo-Saracen style of architecture, Albert Hall is a prototype of the Victoria and Albert Museum in London. Colonel Sir Samuel Swinton Jacob had designed Albert museum and Edward VII laid its foundation stone in the year 1876. 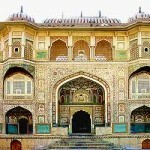 Amber Fort:-Amber fort, also known as Amber Palace boasts of an artistic grandeur and structural expertise. It is a reminiscent of the bravery and courage of the mighty Rajputs, who had played a remarkable role in the history of medieval India. 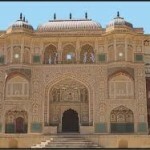 This rambling Palace depicts the true lifestyle of the gutsy Rajputs.